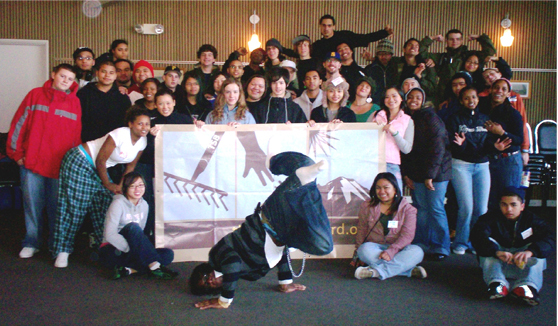 From January to June, 48 high-school students from across Seattle participate in community service, mentoring, and snowboarding. 24 young-ish adult volunteers provide logistical support, listening, and friendly camaraderie. The core program operates in two locations: the Central District and White Center. Each program meets twice a week for six months. Tuesday nights (White Center) and Wednesday nights (Central District) bring job skills training, workshops with former drug users, family-style potluck meals, discussions on body image and sexuality, and making valentines for senior citizens, to name a few. Sundays alternate between community service projects and snowboarding. Cookies, music, snowballs, fresh food, and a sense of community are the common threads that tie all of this together. Want to know what’s going on? Check out the Program Calendar!